john4jack (Corvallis, Oregon, United States) on 19 November 2009 in Transportation and Portfolio. Wonderful textures, a stunning b&w! Very nice details of this iron monster ! Close, personal, powerful and beautiful ! Great capture! I like the mono tones. The detail and textures are amazing. Superb in black and white and great framing ! Nice work on textures Jack. I can feel the grainy texture of the metal... A rich B&W mono. NEat processing on this one. We love old locomotives in this house! 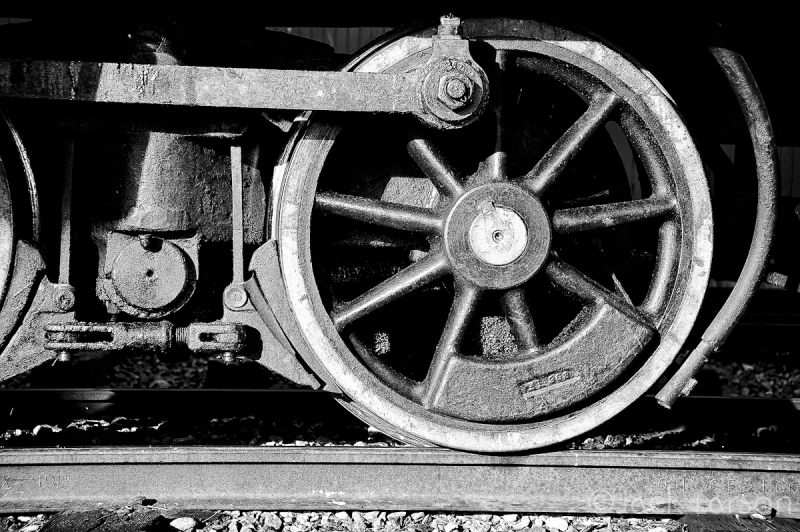 The wheels that changed once the world =) Nice bw! Interesting and beautiful details ! A photo every man will adore ... wonderful detail. Nice shot and processing. This set of train photos is fantatsic. Congratulations. A B / W glossy and bright! I like the texture of light on metal! Very industrial, nice detail, love engines. A fine close up of this impressive engine wheel. I like the processing which gave the shot a wonderful metallic look. Very nicely done. Super shot of the drive wheel. The B&W and the grain are just right. Excellent textures and tone. Definitly a classic b&w. a nice méchanic ;jack ! Superb. Beautiful picture. Have a good day. Antoine. wonderful textures in the b&w and of course the subject matter is great too. strong BW... I like it!! Excelente serie sobre el ferrocarril. Me agrada en especial esta de hoy. Un perfecto B&W con una textura extraordinaria. Great job of "training" your sight on this drive wheel. Love the BnW treatment which provides great contrast. Superb detailed shot. Very effective in black and white. A strong B&W, with beautiful details and contrast. B&W really brings out the texture. Nice composition. I do enjoy the up close and personal shot, Jack. Well done. Great series! This is such a classic train and you've captured it beautifully in so many ways.